Chateau / Country House3229 sq. ft. 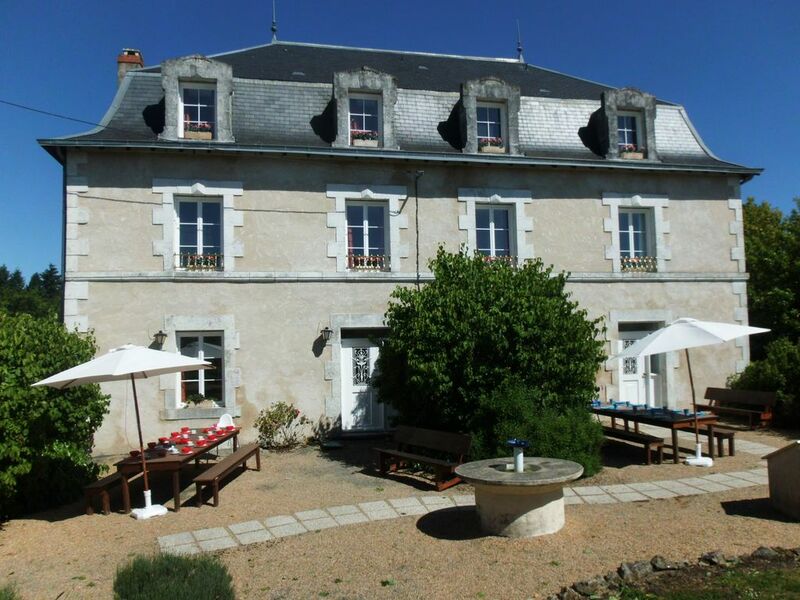 Le Grand Etang 12 bedrooms, 5 bathrooms, swimming pool and children's pool. This stately completely restored mansion is located on the outskirts of the village of Saint Saud Lacoussiere where you will find all necessary amenities. The house provides living space for 20 people and 4 babies of which up to 12 adults are ideal for family matters with young children up to 12 years. This villa is not rented to groups of young people. Within walking distance of a recreational lake 'Le Grand Etang' 'where you can swim and fish. The house is surrounded by a garden of 8 000 m2. Under the large covered hangar of 16m x 16m, you can make delicious bbq and use of the plancha's. or relax in the lounge set. The children can play with various play equipment including, swings, trampoline, air hockey, boules, football, volleyball and swimming in the children's pool 5m x 5m 0,40 cm deep. In the school's this house as a whole is rented, outside of school, you can choose the apartment Cezanne and Renoir. The other property that is not rented by you then i closed. a.m. the privacy. Adapted bathroom on the ground floor in the home of Cezanne. Suitable for the disabled and elderly. Minimum rental period is one week, our changeover day is Saturday, arrival after 17. 00 hours before departure 10. 00. In the village of Saint Saud Lacoussiere, follow signs' Le Grand Etang ''. Just outside the dorp1,2 km you will see the mansion. Onze huurprijzen zijn inclusief, eindschoonmaak, beddengoed, handdoeken, water en elektrisch verbruik. Badlakens voor bij de zwembaden dient u zelf mee te nemen. Minimale huurtermijn 1 week, wisseldag zaterdag, aankomst na 17.00 uur vertrek voor 10.00 uur.Deze villa wordt niet aan groepen jongeren verhuurd.